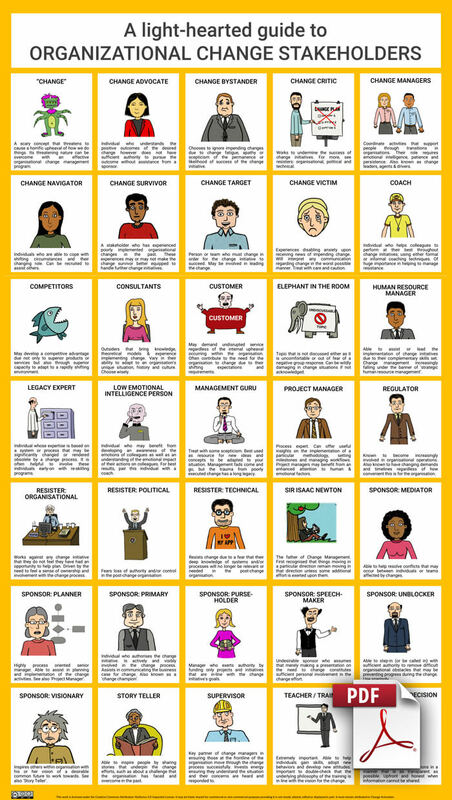 This fun poster identifies 35 people and groups commonly found during changes within organizations, describing how they are likely to react to changes and some of their other unique characteristics. People planning changes can use it to better understand how individuals and groups differ in their responses to change. Step 3: Pin it up! Scary creature of an idea that threatens to cause a horrific upheaval of how we do things. Its threatening nature can be subdued with an effective change management program. Individual who understands the positive outcomes of the desired change however does not have sufficient authority to pursue the outcome without assistance from a sponsor. Chooses to ignore impending changes due to change fatigue, apathy or skepticism of the permanence or likelihood of success of the change initiative. Works to undermine the success of change initiatives. For more, see resisters: organizational, political and technical. Coordinate activities that support people through transitions in organizations. Their role requires emotional intelligence, patience and persistence. Also known as change leaders, agents & drivers. Individuals who are able to cope with shifting circumstances and their changing role. Can be recruited to assist others. Employee who bears ‘war-wounds’ from poorly executed changes. These experiences may or may not make the survivor better equipped to handle further change. Person or team who must change in order for the change initiative to succeed. May be involved in leading the change. Experiences disabling anxiety upon receiving news of impending change. Will interpret any communication regarding change in the worst possible manner. Treat with care and caution. Individual who helps colleagues to perform at their best throughout change initiatives; using either formal or informal coaching techniques. Of huge importance in helping to manage resistance. May develop a competitive advantage due not only to superior products or services but also through superior capacity to adapt to a rapidly shifting environment. Outsiders that bring knowledge, theoretical models & experience implementing change. Vary in their ability to adapt to an organization’s unique situation, history and culture. Choose wisely. Typically demands undisrupted service regardless of the internal upheaval occurring within the organization. May contribute to the need to change due to shifting needs or expectations. Topic that is not discussed either as it is uncomfortable or out of fear of a negative group response. Can be wildly damaging in change situations if not acknowledged. Able to assist or lead the implementation of change initiatives due to their complementary skills set. Change management increasingly falling under the banner of ‘strategic human resource management’. Individual whose expertise is based on a system or process that may be significantly changed or rendered obsolete by a change process. Individual who may benefit from developing an awareness of the emotions of colleagues as well as an understanding of the emotional impact of their actions on colleagues. For best results, pair this individual with a coach. Treat with some skepticism. Best used as resource for new ideas and concepts to be adapted to your situation. Management fads come and go, but the trauma from poorly executed change has a long legacy. Process expert. Can offer useful insights on the implementation of a particular methodology, setting milestones and managing workflows. Project managers may benefit from an enhanced attention to human & emotional factors. Known to become increasingly involved in organizational operations. Also known to have changing demands and timelines regardless of how convenient this is for the organization. Works against any change initiative that they do not feel they have had an opportunity to help plan. Driven by the need to feel a sense of ownership and involvement with the change process.